Being an avid player of Palm games for quite a long time now, and having had the fortunate opportunity as an associate writer of Palm sites to be offered lots of games for review, I do believe I might make a fair judgment when I say that Astraware's game Mazera is one of the best Palm games around. Developed by California’s Cold River Studios and released by Astraware during Fall 2004, Mazera is a unique game which defies easy categorization into any of the known and popular game genres of the sorts of Role Playing Games, Arcade, or Puzzle Solving. In a way Mazera could be said to be all and any of the above, but this might do an injustice to a brilliant game which might be rightfully thought about as defining a category of its own. 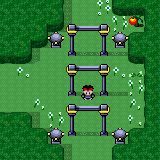 Basically, the game revolves around the story of one LX, a super-hero of sorts, who's quest is to make his/her way out of an alien prison-land. Your quest as a player is to guide LX through literally hundreds of beautifully rendered screens which present challenges of many sorts and types. On some, it might have to do with dexterity – as you have to manage your way around monsters and traps of all sorts. On others a keen perception, good memory or fine deduction skill might prove to be more suitable. Others still, present you with intricate and imaginatively crafted puzzles, the difficulty of which lies as much in the need to uncover what the problem is, as in actually finding a workable solution to that problem. Each screen is creative, and the game offers so many surprises and requires so many ways of thought and play that playing it is a sheer delight rarely found in many of the best games on the market. In terms of difficulty level Mazera is hard to judge. It does not have a steep learning curve per se, as you can launch the game and start playing in a matter of seconds but undoubtedly some of the game aspects would require much more in order to master. This is a game of creative imagination and of "thinking outside the box". Mere going around or implementing the same old tricks found in most others games – might prove to be not good enough. Beyond its challenging aspect, Mazera is a real fun game which offers the opportunity to explore vast and artfully devised territories, with beautiful scenery, interesting and funny creatures, and compelling atmosphere. Playing it feels like embarking on a real unique adventure in a strange and new world which awaits you in your bag or pocket (or wherever you hold your Palm). 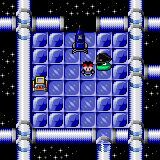 In addition to the brilliant gameplay, Mazera offers a great music track, which complements and enhances the whole unearthly experience, as well as some great art-work, which is almost hard to believe is even possible on low-resolution devices like the Treo 600. Of course – those of you who have hi-res, would enjoy the enhanced version, but you can trust my word that none of the game's beauty or splendor is lost even on the less able PDAs. The bottom line – Mazera is no less than an utterly BRILLIANT game, and a real gem in Palm's treasure chest. To sum it up in the words of my beloved girlfriend – "This game is what a real Labyrinth should be. The single thing it lacks is David Bowie".